First-time instructor learns overcoming obstacles is the hardest part of teaching high schoolers. "Would you like to teach a class to high school sophomores?" the staff email asked. I work in St. Lawrence University's communications department, and I had always wanted to try teaching. Now I had an opportunity to teach whatever I wanted. Of course, I chose my two favorite subjects: graphic design and open source. I submitted a proposal to teach a class called Graphic Design Using Open Source Tools for the St. Lawrence University Scholars Enrichment Program (SLUSEP) over eight Saturday mornings. My first challenge was finding computers for my students to use during class. The university was in the process of updating hardware, and I asked the IT department for 10 castoff PCs on which I planned to load Linux. Unfortunately, the hardware transition wouldn't be complete until after my class had started, so that wouldn't work. My next idea was to find a space that had 10 workstations my students could use. I was in luck! There was a computer lab with dozens of Windows 10 machines that I could use. Great! Now all I had to do was load some open source software—Scribus, GIMP, and Inkscape, in particular—and I'd be all set. Nope. I wasn't allowed to load any software onto these machines. Uh oh. How could I teach software when I can't install the software to teach with? Also, before I met my class of 10 teenagers, I made assumptions about their technical abilities. Because they are children of the 21st century, I assumed that they were born technically savvy, knew the ins and outs of the command line, and could find their way around the C drive with ease. Never assume. I had to backtrack on my lesson plan to include basic computer functions, such as finding and launching programs, filename extensions, copying files—and then finding them. I overcame both of these challenges thanks to USB flash drives. I solved my software installation (or lack thereof) problem with PortableApps, an open source tool created by John T. Haller, that allows you to run applications from a USB drive (or other portable drives, the cloud, etc.). Because PortableApps works with Windows—and there are a more than 300 apps available, including Scribus, GIMP, and Inkscape—I was in luck. The next trick was to get flash drives for my 10 students. I didn't want to buy a bunch of flash drives on my own dime, so I found a great solution. One of the vendors I work with through the university's communications department just happens to be in the personalized flash drive business. 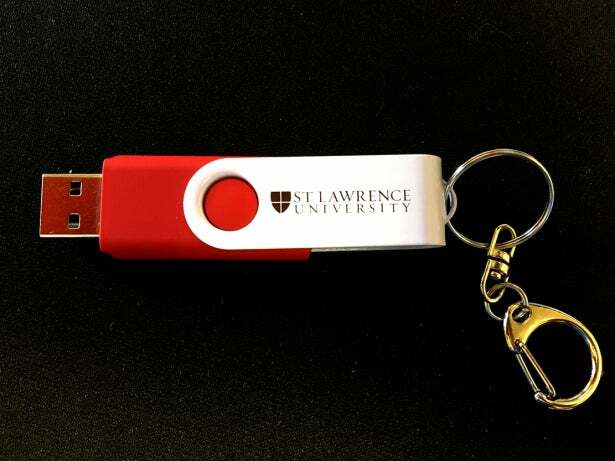 They helped me procure the requisite flash drives, branded with St. Lawrence's logo, at minimal cost. These made great giveaway items for my students, who were thrilled to get them. Once my box of flash drives arrived, I was ready to install PortableApps and the apps I planned to teach. The process was extremely slow, so I tried reformatting some drives to FAT and others to NTFS, but that didn't make much difference. My workaround was loading several of them at a time on different machines in the computer lab. I tested each drive to make sure everyone got working equipment, and I had my technology issues taken care of. Now, what to teach? Because I had never taught a "real" class before, I researched curriculum creation software and methods others have used to teach graphic design. I experimented with Open Education Resources Commons, which was created by the Institute for the Study of Knowledge Management in Education (ISKME). It offers a lot of resources, and this would have been of great value had the class been a semester or a recurring program, but I only had a single, eight-week block of time. I needed to concentrate on creating content more than the infrastructure to support it. I decided to stick with my basic WordPress site and post the schedule and other pertinent info there. As it turned out, this, too, was overkill. My lesson plan changed each week as I evaluated the students' prior abilities and knowledge and realized that I would have to go slowly and cover the basics first. Because the primary purpose of the class was to learn graphic design, I decided to expose my students to a variety of open source apps and Adobe software, which was already installed on all the PCs. A local health food market was conducting a t-shirt design contest, and I made this the first project for the students. The students could use only graphics found on Creative Commons or their own creations. We worked with the Adobe tools for a few sessions, then we switched over to the open source apps on PortableApps. We experimented with opening and using several apps (Inkscape proved to be their favorite) and installing new ones, such as CintaNotes. As in marketing, knowing your audience is paramount. I had developed lessons without realizing that the students didn't have the computer background I had assumed. To properly prepare for a class, the instructor must know the teaching environment. Fortunately, I was able to overcome my technology obstacles with PortableApps and WordPress, but I started out panicking that I would be unprepared for my own class. If I get to do this again, I will take a much different approach. I will devote the first class or two to basic computer operations, then dive deeper into PortableApps. Once the students grasp those concepts, I will focus just on open source graphics apps. For a short class, that will probably mean Scribus and Inkscape. For a longer course, I could introduce Blender, OpenShot, LibreOffice, GIMP, and maybe some of the mysterious apps I found on PortableApps. I left the students with one last homework assignment: Use your PortableApps flash drive, try out different apps, and do not accept that everything "has to" be done with Adobe or Microsoft or Apple. Open source tools are like any other tools, but what can be done with those tools is in the hands of the creator.